Olive buckets were originally used in Greece and Turkey to collect, you guessed it, olives. 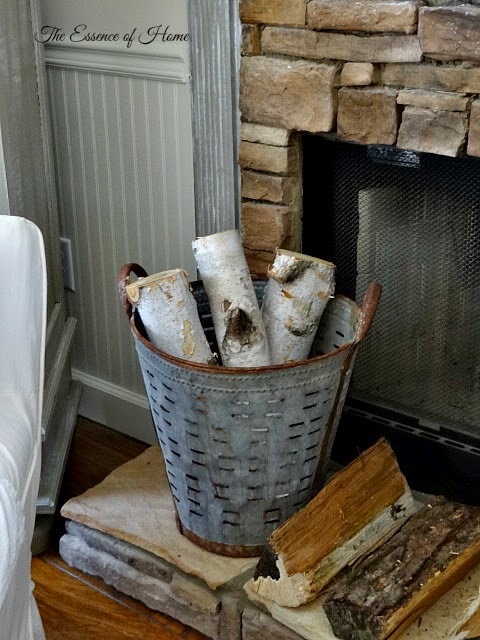 Now, these beautiful vintage hunks of metal make for some serious swoon worthy fall decor. 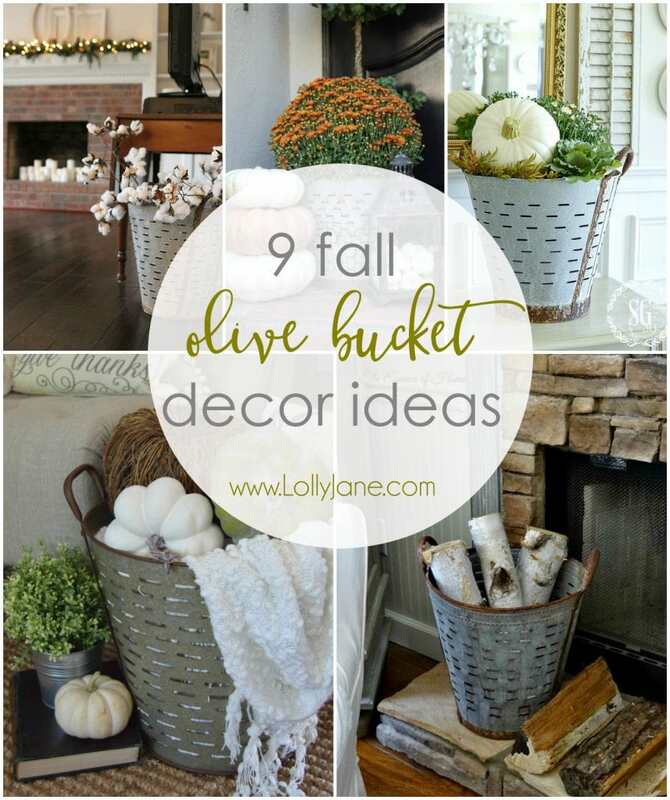 I’ve got a bunch of fall olive bucket decor ideas going through my head. I can already see using an olive bucket for this years Christmas tree stand. Olive buckets make for pretty storage around the house and are perfect pieces to throw a pumpkin inside and call it fall decor. Kelli’s dining room fall tablescape will give you more fall decor ideas and her farmhouse shelves will make you want to DIY your own. More places for all those pumpkins, right?? 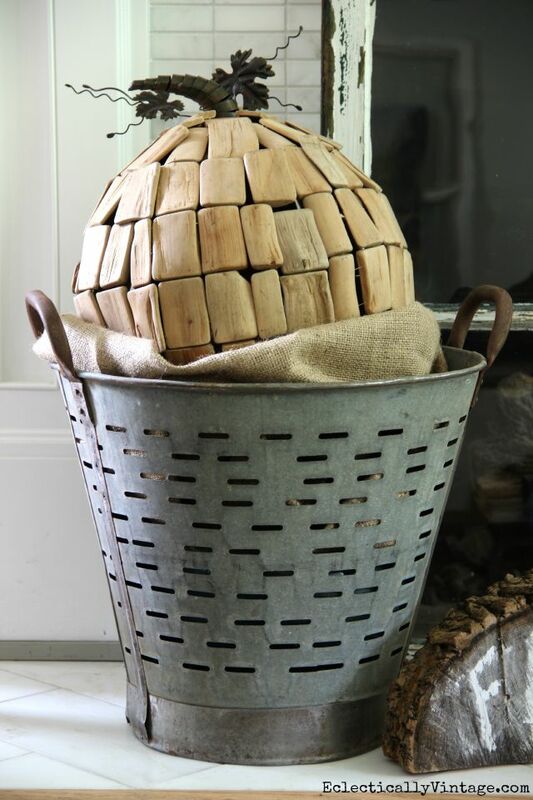 An olive bucket filled with logs is a an attractive way to store firewood: practical decor, via The Essence of Home. Driftwood pumpkins with burlap inside an olive bucket are the perfect neutral fall decor, via Eclectically Vintage. 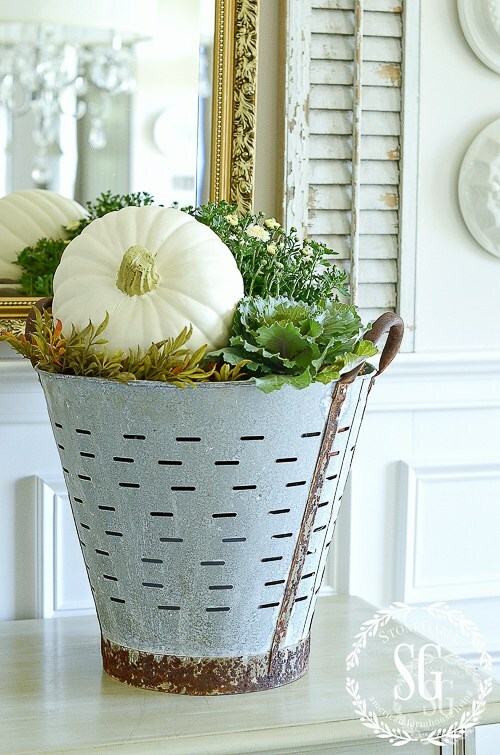 Fill an olive bucket with fresh greens and a white pumpkin to bring fall indoors, via Stone Gable. 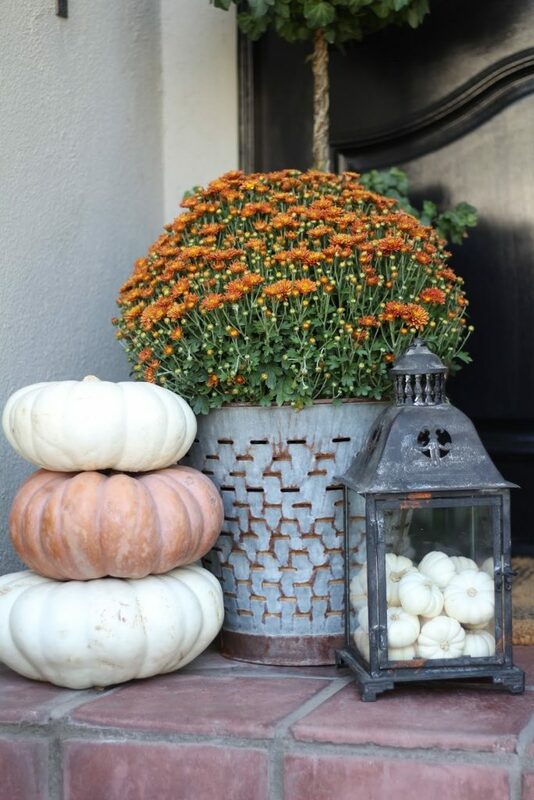 These orange mums in a vintage olive bucket welcome fall decor to this lovely home, via Maison de Cinq. 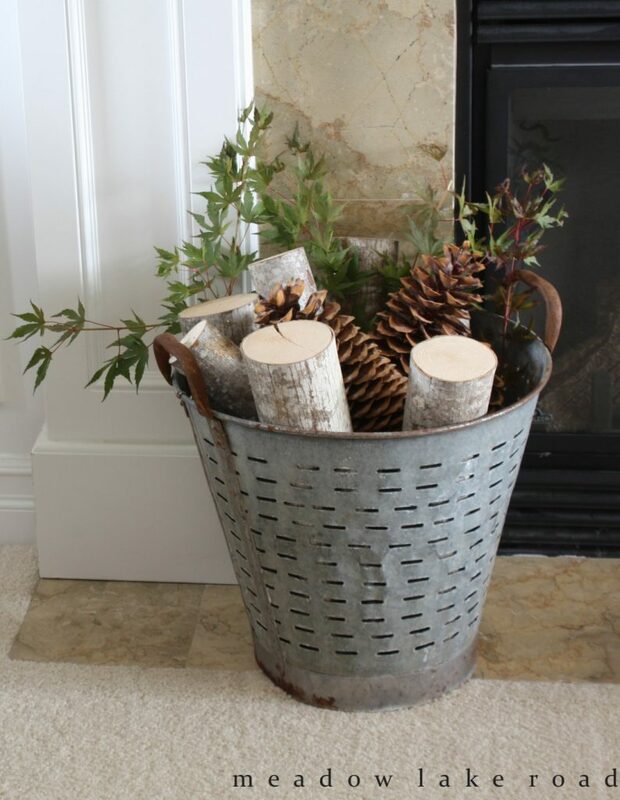 Fresh logs, pinecones and greenery in an olive bucket get me excited for simple fall decor, via Meadow Lake Road. 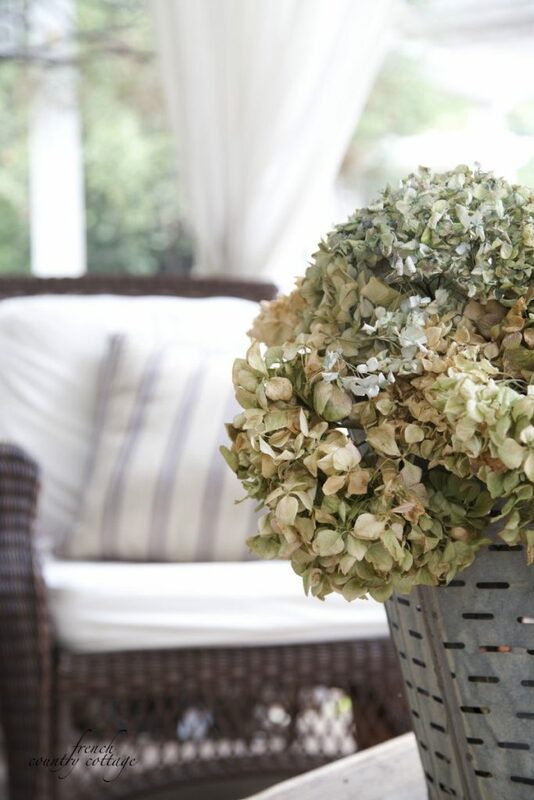 Loving this olive bucket filled with gold hydrangeas, via French Country Cottage. 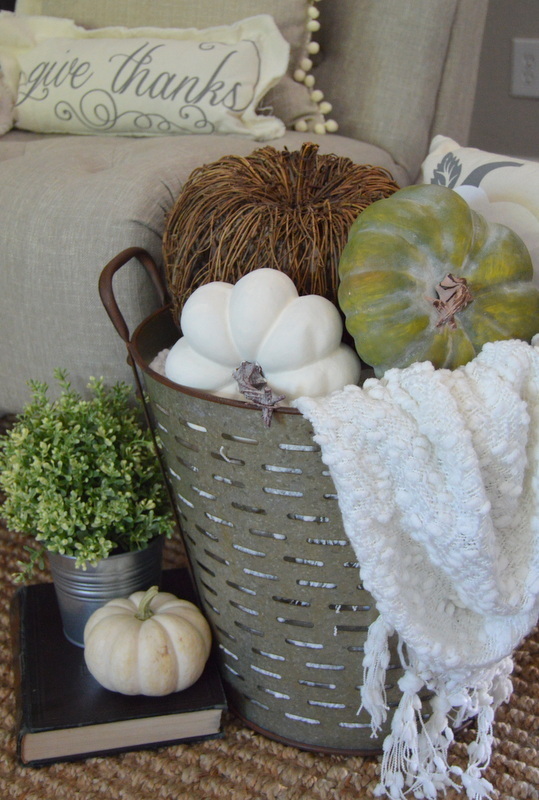 Fill an olive bucket with faux pumpkins and a soft throw for easy indoor fall decor ideas, via Home Remedies. An olive bucket filled with cotton stems is double duty decor: fall and/or winter, neutral can serve two decor master, via Paige Knudsen. 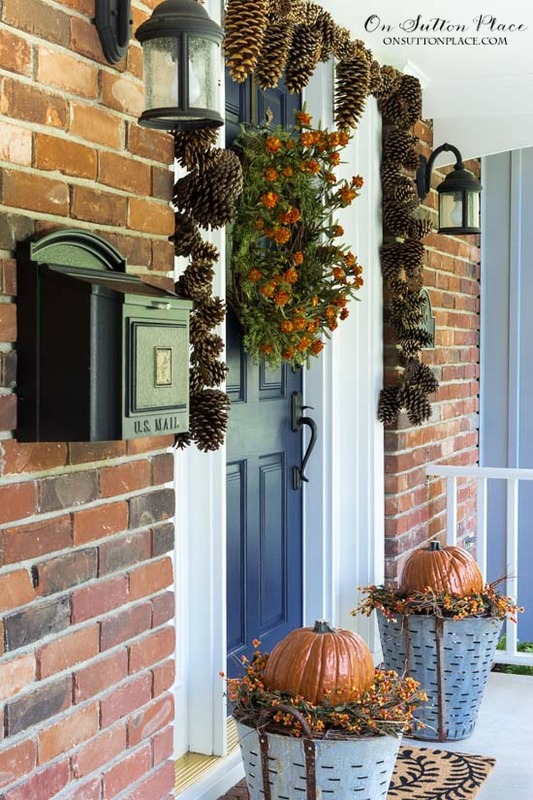 Layer a grapevine wreaths, fall leaves and a pumpkin on top of your olive bucket for easy fall porch decor, via On Sutton Place. 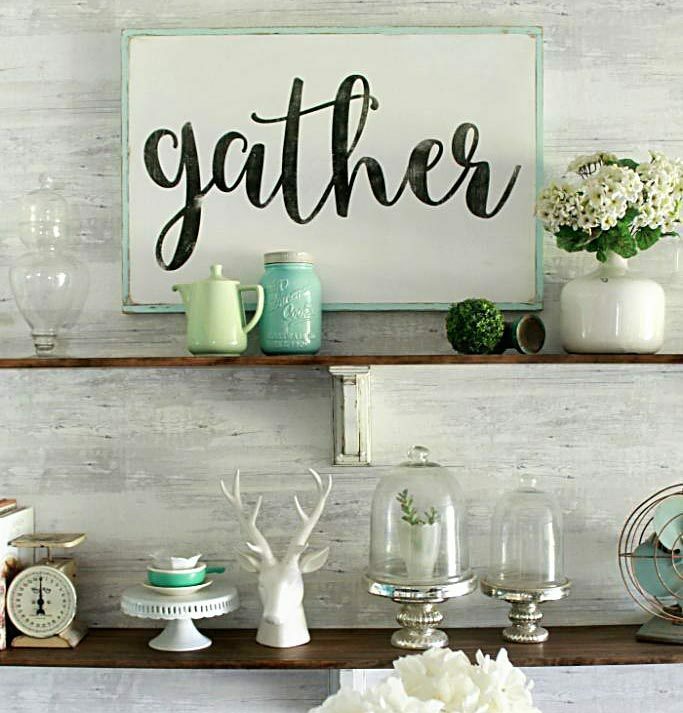 Need more fall decor ideas? We got you covered. 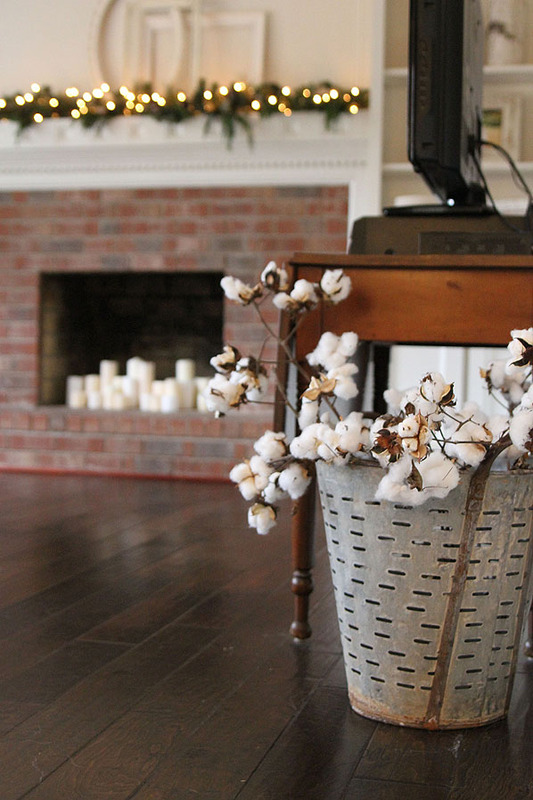 Check out our 50 fall mantel inspirations to well, inspire you. Please don’t forget to PIN so your friends can enjoy, too! Lovely ideas! Those olive buckets match perfectly to all that fall mood,andI think I have two of them buried somewhere in the garden shed. I love using flowers for my fall decorations and often prefer mums in bright colors. Thanks for the inspiration! I looked for mums yesterday but don’t think they’re in season quite yet! So pretty!